The idea for the Jagdpanzer IV is born in December 1942 when the Waffenamt (the German weapon department) expresses the will to replace the Stug III with a vehicle based on the hull of the PZ IV and capable of receiving the 75mm Pak 42 L70 gun intended for the future Panther tank. Despite the resistance of Guderian (in his function of General Inspector of Armoured Weaponry), the company Vomag developed the concept. On March 13, 1943 a wooden model is presented, followed in October 1943 by a soft steel prototype. The new vehicle shows the same outline as its predecessors based on the hull of the PZ III. The absence of a turret gives it a low profile and the main armament is housed in a compact superstructure. The same advantages are therefore present: easy to build, at a reduced cost and with fewer raw materials used. This new vehicle is officially called Jagdpanzer E39 and the production starts near the end of 1943. A Jagdpanzer IV L70 (A) (Sd.Kfz 162/1), 278 units produced by the company Alkett, recognisable by its higher upper hull installed on the non altered lower hull of a PZ IV, and added with a vertical section of 50cm. A Jagdpanzer IV L70 (V) (Sd.Kfz 162/1), produced by Vomag, keeping the typical low profile of the Jagdpanzer IV. It is this version produced in 940 units until April 1945- that will be the subject of this article. 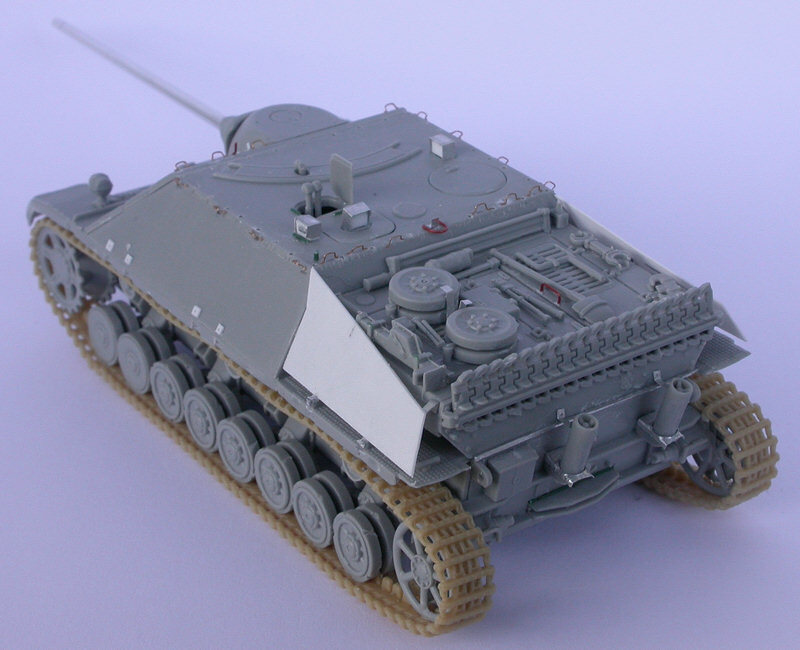 During its production, the Jagdpanzer experiences the same modifications as affected on the PZ IV: it sees an Ausf F to Ausf J, the running gear is simplified (the support rollers are reduced from four to three in September 1943), Thoma Schuerzen are installed, etc (please refer also to the special issue dedicated to the PZ IV in Minitracks N° 4). The heavy weight of the 75mm L70 gun on the front suspension limits the mobility of the vehicle, which gives it the not so lovely nickname The Duck of Guderian. In an effort to solve this shortcoming, during production the engineers decide to change the front road wheels. Plain steel road wheels replace the classic rubber-tyre ones. The lack of mobility remains though a shortcoming of the Jagdpanzer IV L70. Equipped with a gun the size of the 75mm L70 it tends to get stuck in the mud during movements. The weight of this 26 tonnes tank destroyer limits its speed at a 35 km/h despite a powerful 12-cylinder HL 120 TRM Maybach engine. As stated before, the main armament of the Jagdpanzer IV is a long barrelled 75mm gun without muzzle break, mounted on the hull. This configuration limits its hand traverse to 12 degrees on each side of the gun with a vertical training ranging from minus 7 to plus 15 degrees. Next to the gun at the right side a MG42 is installed. This tank destroyer can carry up to sixty 75mm shells, and is managed by a four-men crew: a tank commander, a loader, a gunner and a driver, all rather squeezed in this very low and compact tank. The first Jagdpanzers IV L70 (V) are delivered in August 1944 and are primarily reserved for tank destroyer battalions (panzerjager abteilung). Considering the circumstances however, many of them join classic armoured battalions where they operate next to Panthers and PZ IV. This has a negative impact on the Jagdpanzer IV though as they are designed as tank destroyers. The Panzer Brigades 105 and 106 are the first brigades to receive the Jagdpanzer IV. They are most widely deployed during the Battle of the Bulge with 137 units in service at the beginning of 1945. Used both on the Eastern front as in the West, the Jagdpanzer IV L70 lasts more or less successfully until the end of the war (on April 15, 1945 close to 300 units are in theory- still in service: 278 at the Eastern front, 3 at the Western, and some 10 in Italy). Some units even end their career in the Syrian army during its conflict with Israel. Matchbox has a 1/76 model. The latest Dragon model offers a moulding of an exceptional quality and goes with all the gadgets issued by this Chinese manufacturer: one-piece road wheels, soft-plastic tracks, even an aluminium barrel is included. But this is exactly what contributes to the paradox of this kit: everything is there to assemble a Jagdpanzer IV of unequalled quality, if it wasnt for the fact that the hull is 1mm50 too high. This has consequences for all angles of the superstructure, and is particularly visible at the level of the mantlet in front, which -entirely correct in itself- does not reach up to the front deck, as should be the case. This mistake can only be corrected by remodelling the entire hull, which makes this kit rather useless. As can be expected the assembly goes smoothly and everything fits just right. The Dragon kit is an easy kit that can be assembled in just a few hours needing only minor modifications. Starting with the hull and the suspension, we note that the latter is very accurate including the typical plain steel front road wheels instead of the classic rubber-tyre ones. It also has the correct number of three support rollers typical for this vehicle in its late production (as also on the PZ IV Ausf J). The flexible tracks also accurate- can be mounted without difficulty with classic model glue. For the hull of this late production model the exhaust pipes at the back are completed with pieces of aluminium foil. The fixing system for the Schuerzen at the sides of the hull is simulated with the help of small pierced squares of styrene sheet. The Schuerzen for the engine deck are cut out of the same styrene sheet using the Schuerzen of the kit as a model. The handles for these Schuerzen are cut out of a band of aluminium foil and are folded in such a way that they can support efficiently the Schuerzen. Two handles made of copper wire are also added on the engine deck (note that its hatches can be mounted in open position). The fixing system for the spare road wheels is made out of aluminium foil. The on-vehicle tools provided by Dragon being already very accurate they will not be detailed any further. The three episcopes to be placed on top of the hull that come with this kit are replaced by ones made out of a thick bloc of styrene sheet and a piece of aluminium foil. The hooks (15 in total) to fix a camouflage net or branches are made out of thin copper wire. 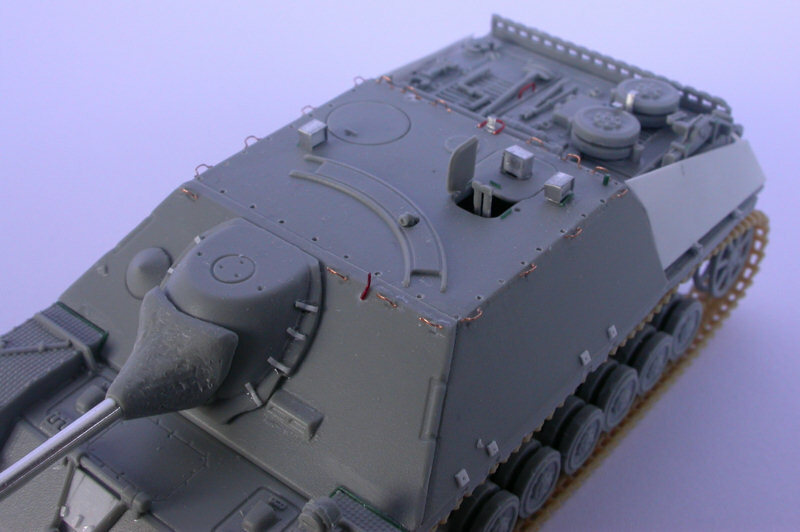 A foresight for rapid shooting is also added on the hull, just in front of the episcope of the tank commander. At the back of the hull less modifications have to be done: the mantlet is slightly altered with pieces of styrene sheet and the travelling clamp has to be adapted to the later models in plain steel. Finally the iron sheet to assist the crew climbing on to the tank is added at the front of the hull. The choice was made for a decoration proposed by Dragon: a Jagdpanzer IV during a winter campaign in 1945 in Hungary. To start the model is given a classic dark-yellow coat, followed by a two-tone camouflage in brown and green, a classic scheme for the late production vehicles. The painting is applied roughly using a brush. Although this camouflage will be covered later on, applying it is important to bring out the various keys of the final white-coloured cover. A very thin white layer -almost transparent- is then applied on the entire vehicle, still leaving the initial three-coloured camouflage visible. Finally specific spots will receive a deeper white touch, using much diluted white Tamiya paint (white satin) applied at a low air pressure as close as possible to the model. This process is repeated until a satisfying result is obtained. The road wheels and the pieces of the on-vehicle tools are slightly retouched with a brush. At this stage the decals are put on the model since they have to undergo the same aging process as the rest of the vehicle. For this process a much-diluted burnt Sienna wash is applied on the entire vehicle, without spoiling the white colour of the camouflage. This wash is followed by a less diluted wash applied with a fine brush in certain recesses. 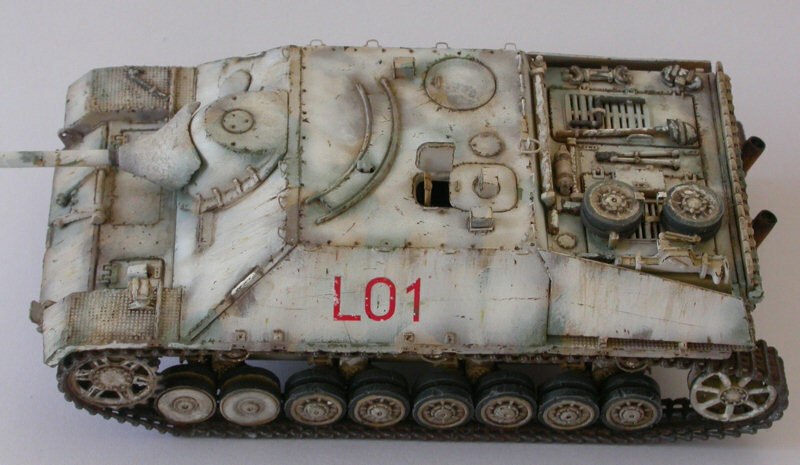 The weathering is finalised by adding scratches and grazes in different tonalities according to their place on the vehicle. Crew exit zones and hatch areas are emphasised. Finally some spills in different shades of rust and brown soil the white camouflage. 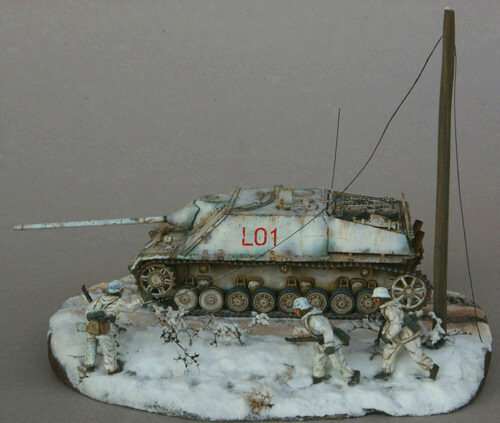 The figures used are from Caesar, ref: H005, German Infantry in Winter Dress. This set was released in 2005 and represent German infantrymen in reversible winter uniforms, which makes them useful in various settings. They have lively gestures and one can only regret the absence in this Caesar set of arms that are more typical for the end of the war (such as a MP44 or a panzer faust). Four figures are chosen to represent an infantry column advancing on a slope under cover of a Jagdpanzer IV. The infantrymen wear their reversible winter uniforms with the white side out as to mend in to the snowy winter landscape. The colour white and the same thing goes for the colour black- stays a difficult colour to reproduce. Skull White from Game Workshop is applied as a primer, followed by a white Humbrol to which just a touch of light brown is added. These layers having completely dried, applying diluted burnt Sienna with a fine brush and highlighting with pure white evokes the tissue of the uniforms. The various gears of the infantrymen are painted using the usual Humbrol colours for German soldiers. Their faces are painted with Humbrol while burnt Sienna is used for shadowing. The chosen scene is meant to show to advantage the Jagdpanzer IV. Rather than emphasising on the historical accuracy of it, the scene should therefore be considered as a striking image. The scene is situated in Hungary during a snowstorm in the winter of 1945 when a column of infantrymen advances under the protection of a Jagdpanzer IV. As not to cover up the vehicle with the figures (and vice versa for that matter), the scene is build on two levels: an upper level depicting the road where the tank destroyer advances and a lower level were the figures walk. 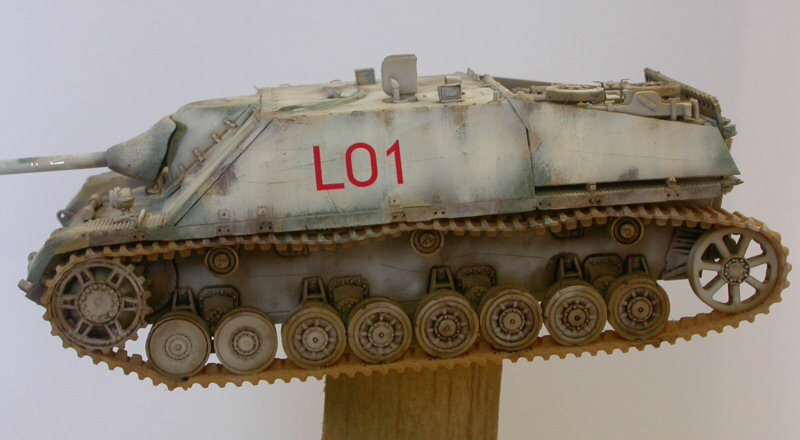 These levels are carved out of a bloc of styrene cardboard that is covered with plaster in which the traces of the Jagdpanzer are imprinted before drying. The scene is then airbrushed using a dark brown colour. 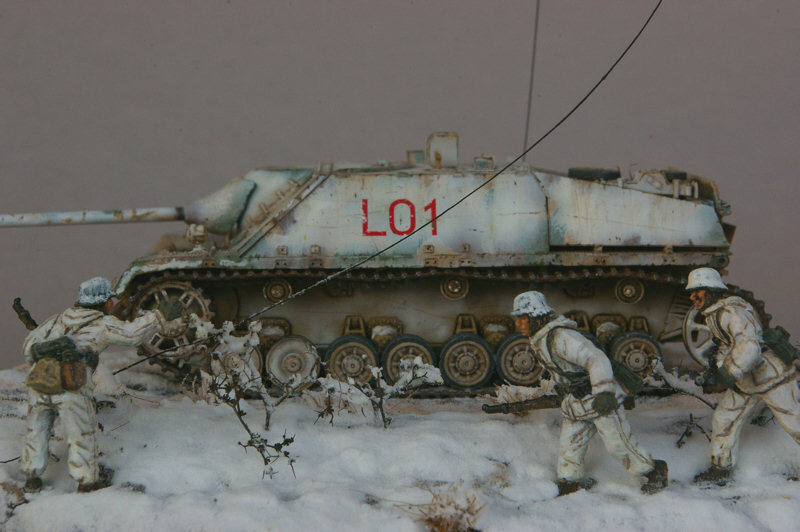 The entire surface of the scene excluding the spots where the tank and the figures will be attached- is covered with wood glue using a brush, after which powdered bicarbonate of soda (available in pharmacies) is applied. Once the scene has dried, it is painted in shiny white applied at a low air pressure in order to fix the snow and to obtain a sparkling effect. A brown veil is applied on the borders of the tracks imprinted by the Jagdpanzer in order to simulate small particles of earth due to the passage of the vehicle in the snow. 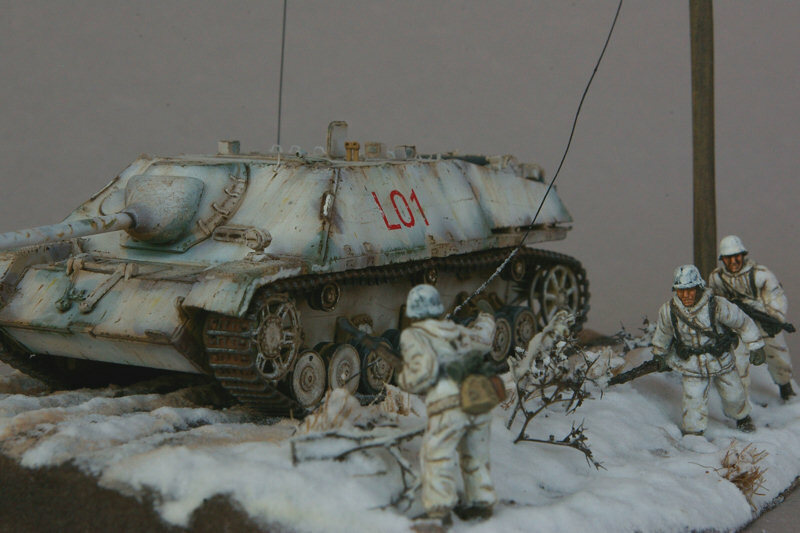 Finally the Jagdpanzer and the figures are positioned and fixed on the scene using Superglue.